Cúig Studio artists are delighted to be exhibiting at “lost & Found’ a group show at Film Base, Temple Bar, Dublin. 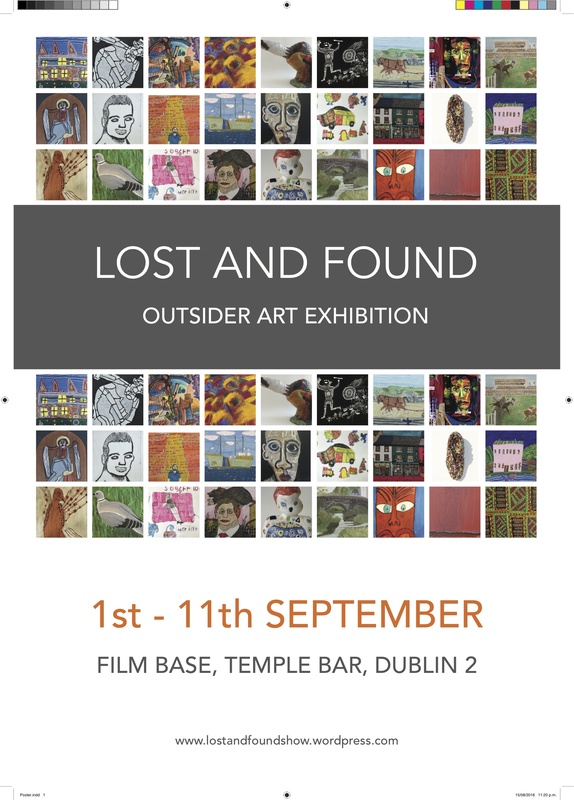 ‘Lost & Found’ is the title and theme of the exhibition, organised by artist Yvonne Kennedy. The artists were given the freedom to interpret the theme and develop work for submission. Those involved are from different parts of the country, some work in supported studios, others work alone. All of these artists have exhibited before, at ‘BEYOND; Irish Outsider Art’ which was curated by Brent Pope in 2015. The artists exhibiting are comprised of painters, illustrators, textile artists and some sculptors. It is very exciting that this group can come together and exhibit again, it will be a great opportunity for them to meet in Dublin. The show opens at Film Base on Sep 1st 2016 and will run until Sep 11th.